Boston, MA and Atlanta, GA, November 15, 2016 – Powerhouse Dynamics , creator of the award-winning SiteSage® enterprise asset and energy management system, and Rheem®, producer of water heaters, boilers, and HVAC equipment today announced a new partnership. The two companies have teamed to install SiteSage sensors on Rheem’s innovative and award-winning H2ACTM Rooftop Unit, the first and only integrated air and water system designed specifically for full-service restaurants and other commercial applications with high hot water demand. By integrating their rooftop units with SiteSage, Rheem is able to provide their customers with enterprise-wide remote control and access to advanced diagnostic data, which to date has only been retrievable at the equipment site. The cloud-based SiteSage software delivers visibility into system performance on all Rheem units installed across all of a customer’s locations. A complete SiteSage system can control and analyze all key facility equipment in real time to improve operational efficiency. Rheem H2AC units are high-performance hybrid heating, air-conditioning and water heating systems that deliver a comfortable store environment and substantially reduced hot water costs at very high efficiency. The ClearControl™ running Rheem rooftop unit collects a broad range of data on the system’s operation, which can be used to ensure the units are operating at peak performance and can help technicians diagnose any issues. Through SiteSage, facilities personnel can now receive alerts generated by the Rheem units, notifying them of developing issues. Before they roll a truck to the location, HVAC technicians can use SiteSage to access detailed operating information, diagnosing a problem remotely and ensuring that they arrive onsite with the correct parts. “Rheem is an innovator in offering highly efficient HVAC technology to their customers, reducing operating costs while keeping guests and employees comfortable. 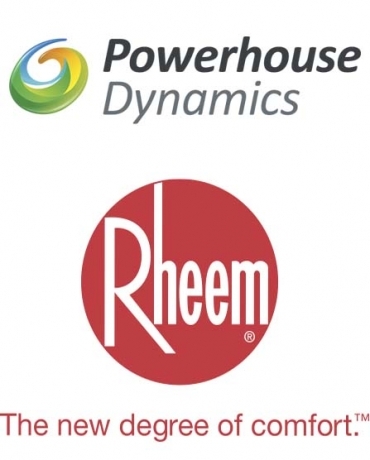 We are proud to partner with Rheem to bring that innovation to the next level, making actionable information available to restaurants, hotels, and other businesses, and their service providers, on demand in real time”, said Jay Fiske, Vice President of Business Development for Powerhouse Dynamics. SiteSage, in use at thousands of restaurants, convenience stores, retail stores and other small commercial facilities across North and Central America, combines enterprise-wide equipment controls with granular monitoring and patented analytics to reduce energy consumption, improve equipment uptime, and reduce labor costs while ensuring food safety. The SiteSage “Internet of Things” (IoT) platform is factory-integrated with a wide range of equipment from commercial ovens and fryers to irrigation systems to HVAC, connecting facility equipment to the cloud.